When Ros Bakst sets her mind to a project, she becomes fearless. She will do whatever it takes to get the job done. Looking around at modest fashion trends, she saw a problem, came up with a solution, and went full speed ahead—rallying the troops to help her accomplish her mission. 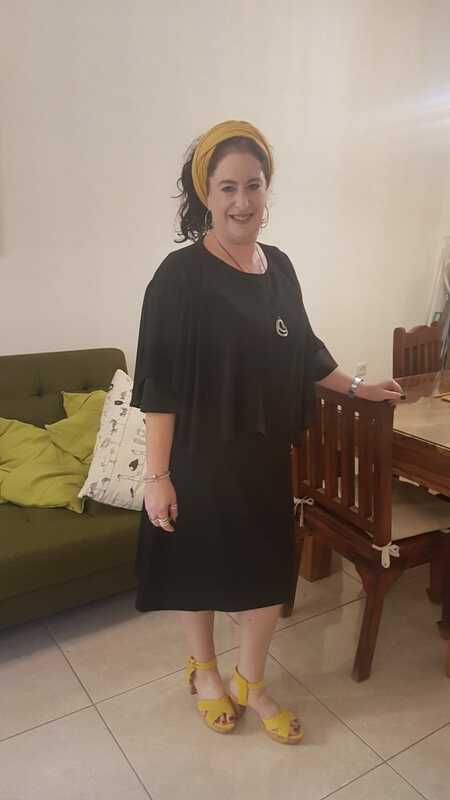 In a world where clothing styles are constantly changing, it is very hard for the frum fashion-conscious woman to keep up. Once in a while, the designs line up with the rules of modesty (think maxi skirts or button down blouses), but what is a woman to do when she sees something beautiful but has no tznius way to wear it? Ros noticed the many layers frum women had to put on in order to make their outfits work—the proper length skirts and sleeves, covered collar bones, etc. She knew there had to be a better way; one that would require no additional layers, and would fit anyone’s style. So she went to the drawing board (literally!). Ros designed a few template dresses—ones that were both modern AND modest—then set out to find the best fashion designer/seamstress willing to help with the customization and turn her ideas into a working business model. It wasn’t long before she found the perfect partner, Revital Avidar (who had her own brand and shop in Europe before coming back to Israel), and Ros’s goal was one step closer to fruition. She brought in an investor and a business advisor, who were both equally excited about her vision, and thus Bakst to Black was born. Ros chose black as her base color (although customers can request the dresses they design to come in other colors), since she felt it always made her look good, even when she was heavier due to health issues. In the future, she plans to make an offshoot brand called, “Block of Color”, but she still loves black best! All of Bakst to Black’s dresses are customizable in length, sleeves, collar, and also in size. The website has a video showing you how to take your measurements so that they can design a dress that will look perfect on you. They also have each dress template listed in 360° pictures so you can be sure it is exactly the way you’d like it. Ros is developing a measuring service directory to help with these measurements, and all measurements are stored in your account for future orders. If even after all that, the dress still needs alterations, Bakst to Black will pay toward the cost of the alterations, with a photo sent to their customer care team and a receipt from a seamstress. Customer satisfaction is their number one priority! Ros not only wants her customers to feel completely satisfied with their purchase, she wants them to feel pampered as well. 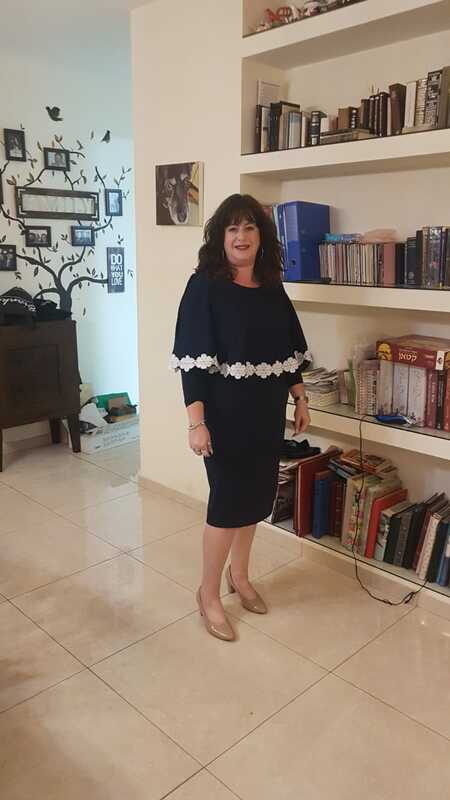 Her dresses are wrapped in beautiful packaging, and she has a special courier service to deliver the order to your door if you live in Israel. Eventually, Ros wishes to grow her measurement and courier services in the US and UK as well, but for now, regular shipping is free in those countries. Her customer care team is available to answer any questions by email. Ros wants to take the hassle out of shopping, and she makes sure that her dresses are made with the average consumer in mind. She started a focus group of women to help her hash out ideas and stay in touch with what real women want to wear. Don’t like labels in your dress? Gone. Want a more modern feel with clean lines? She has that too. Want to wear a dress, but still breastfeeding? Ros has you covered! Ros’s vision is that every woman, no matter what her size or observance level, can feel good wearing a one-of-a-kind dress that was perfectly fitted for her. Ros values her team, as she knows it takes a village! She has a wonderful relationship with Revital, as well as her photographer and models. Her family and friends have all been part of her “support staff”, as she has gleaned inspiration from all of them. Ros herself is no stranger to hardship. Moving to Israel 19 years ago has had its share of ups and downs, and she has had to overcome some hurdles in her personal life as well. After eight years of marriage, and undergoing the emotional rollercoaster of both IVF and pregnancy loss, she was blessed with her daughter, who is now part of her customer care team, and her twin sons, who are now serving in the IDF. When deciding to name her dresses after women who have inspired her, she began with the “Mia”, after her daughter. Ros has made sure to talk about her difficulties in having children with other women who are afraid of encountering problems, to try and raise awareness of these issues in the religious world. Ros lives her life, and runs her business, with the wisdom only gleaned by life experience. She knows that it takes hard work to get anywhere in life, and that the key is to not give up. She had a dream, and she’s going for it. And she hopes to bring the dream of classy tznius fashion to women everywhere! Bakst to Black’s website will be ready for orders with their first few templates on January 1st. In the meantime, follow them on Facebook here, so you can stay updated on their launch! To see The other amazing women who have been featured in past "in the Spotlight"s, Click here!